The Lady Savannah necklace is a unique piece of handcraft jewellery with a lot of effort putting into creating it. This necklace features an unusual hand-finished translucent 15ct large intriguing Ethiopia Opal with some green and blue flashes. The gemstone has a heart shaped lower part and is carefully, sensitively and beautifully mounted in a handmade 925 sterling silver swirl setting. 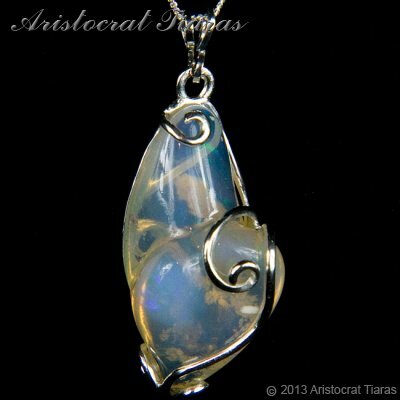 This unusual necklace from Aristocrat Tiaras is part of our Opal jewellery collection for one special mother of the bride or lady to enhance her outfit or makes a unique gift for any special occasion! Please note: the Ethiopia Wello opal is hand cut from a raw natural stone with no treatment and is polished in UK. This is one off gemstone and is unique, the pendant shown is the actual item for sale and the gemstone cannot be duplicated.